If you are a woman and you take your training and fitness seriously, you may have reached the point where you feel that you require that extra support for your back. But do you go for a weightlifting belt designed specifically for ladies? Or not? While womens weightlifting belts are somewhat different to those for men, the main purpose of them is quite the same. And that is to create pressure within the abdominal region of the torso so that stability and support for the back is improved. Luckily most of the top belts for women are very affordable and so are much cheaper when compared more expensive accessories such as the belt by Inzer. Something else worth noting is that the use of these types are not limited to the gym or weightlifting. Many of their wearers use have other practical uses for these lightweight belts such as lifting heavy objects around the house or even when doing the yard work whilst belted. 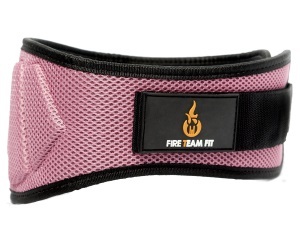 Fire Team Fit Belt Click For Fire Team Fit Belt Price Great all-rounder. Lightweight and comfortable. Fire Team Fit are quite new on the scene and at present only offer a small number of products. But perhaps this is why they are able to produce this great product here. 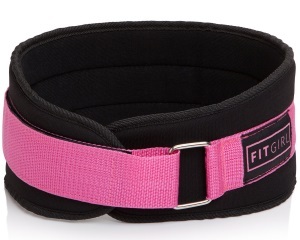 This is the best weightlifting belt for women that we have found so far! The Fire Team Fit weightlifting belt has a sleek appearance and is available in a range of colours including black, blue, green and pink. It features a tapered and contoured design making it thin (3 inches) around the stomach but thick (5 inches) at the back, just where the support is required. This, along with the unique individual foam pad design makes it exceptionally comfortable. But while being comfortable, it is also strong, sturdy and well constructed. Being the best female belt on our list, the Velcro strap adjustment is solid, reliable and is easy to use. We found it to be lightweight making it easy to fit into a gym bag and also flexible enough to not restrict movement, again thanks to the individual foam pad design. It is also manufactured from a sweat resistant and breathable material. We also found the Fire Team customer service to be excellent when we wanted to return the product to get a different size. Harbinger of a well-known brand in the world of weightlifting of which we have reviewed the belts of previously. 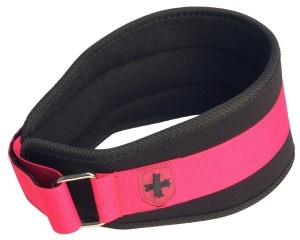 This Harbinger weightlifting belt is designed specifically for ladies (there is a unisex version also) and comes in either purple, pink or green. At a first glance it appears thin, but it is actually deceivingly sturdy. It is 5 inches in width and also includes an additional supporting strap which runs around the outside of the belt. It’s tensioning buckle is manufactured from a heavy gauge steel which should withstand heavy abuse, making this a good belt for heavy lifts. It is extremely supportive and we especially liked the breathable material which meant no excessively sweaty midsection during an intense workout. We found that the Harbinger would slip a little during these intense workouts and so required adjustment a little more than the average weightlifting belt. Firstly, the manufacturers of the Rip Toned weightlifting belt provide excellent customer service. They offer a 90 day money back guarantee so if you are unhappy at all, you can return it for a refund. They also provide you with an e-book which provides you with instructions on how to correctly and most effectively utilise your new weightlifting belt. 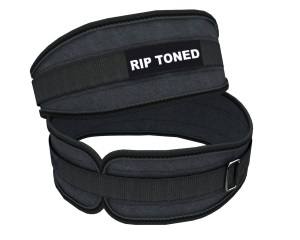 As well as this, Rip Toned also give buyers a lifetime warranty on their belts. The product is endorsed by Kevin Weiss, a world champion powerlifter and has been featured on TV. So buyers are also provided additional e-book which includes Kevin Weiss’s abs guide and Kevin Weiss’s low-carb diet. The belt itself is aimed at novice through to professional weightlifting and is also suitable for male weightlifters. It is manufactured from quality materials which give it a light weight and yet solid feel. This a strong women’s Velcro weight lifting belt with extra support is provided by two Velcro fasteners. One fastener is located on the belt and one is on the outer strap which is fed through a metal clasp. As an extra bonus, it is also machine washable. This is a bit of a curveball and is one for women or girls who are little more serious about heavy lifting or want more support. This is a sturdy weightlifting belt but it is still supple and so won’t require that hefty wear in period or catch the skin that some of the really beefy straps can. Being manufactured from leather, the Dark Iron Fitness weightlifting belt is extremely hard wearing and is built to last. So much so that it even comes with a lifetime warranty. Those metal rivets and double pronged buckle are not going to give way any time soon. But for a leather weightlifting belt, which is also unisex, it is comfortable, lightweight and does not look or feel bulky on the waist. 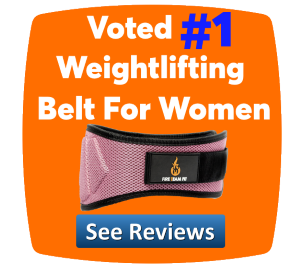 This is the best womens weightlifting belt for powerlifting and offers great value. For a lady we recommend the small size. For those who care how they look in the gym, it also has a nice appearance. The red stitching works well with the leather which has a deep black shine. To be honest, it looks better in real life than in photos. The FITGIRL brand creates fitness accessories specifically for ladies and this is no different and features a cute design that is made for the female body contours. It is comfortable and extremely lightweight to the point where you may forget that you wearing it. So it is not bulky by any means. It can be folded up and placed into a gym bag with ease. This features an external support strap mechanism similar to the Harbinger weightlifting belt but its material is not as breathable. However, this is a great value item providing support for light weights in the gym or crossfit. Plus the manufacturer offers a money back guarantee if you are not %100 sure after 2 months of using it. Schiek is a reputable USA based company which has been around since the early 1990s and are known for their high quality and innovative weightlifting and fitness products which were traditionally manufactured in the USA. 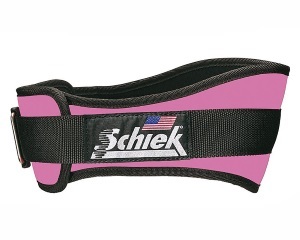 The Schiek 4 inch women’s belt is perfect for smaller individuals and ladies. It is also available in a wide selection of colours and keeping in line with Schiek’s innovative ways; this product also has a bunch of patented features to help to support and contour it to the female form. It also comes with a one year warranty. We found the contours and design made it very comfortable and exceedingly flexible, especially if you have bony hips or a short torso. Also, it does not slip. During our tests, we applied it tightly and not once did we feel the need to readjust it. But this comes at a small cost in that it has a double layer of Velcro to keep it secure. The fastener may take some practice to get used to it but once you’ve achieved that, you have a very secure fitting belt. The Schiek weightlifting belt is sturdy but is also flexible enough for women and not so thick that it interferes with any type of CrossFit workout. And at the same time, it stays in place securely and will not ride up during an intense routine or WOD. 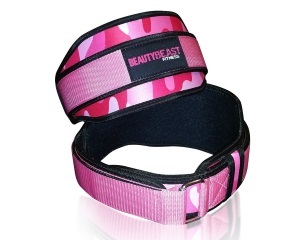 The Beauty Beast Fitness belt is another one which is designed specifically for female athletes. It is currently only available in the pink or blue camouflage colours but we thought these looked great and added a touch of femininity to what can sometimes appear to be masculine weightlifting equipment. Even if you are not a massive fan of pink, this can still appeal. It features a chrome buckle at the front and is also double looped making it sturdy for the heavier and more powerlifting style of lifts. It is also double stitched giving that extra sign of quality. The sizing for this belt is a little larger than expected. So if you find yourself at the bottom of this size guide for your particular waist size, we recommend going down a size. While it has a secure and double looped buckling mechanism, it is still easy put on, take off and to adjust thoroughly. It also provides a lot of support and is designed with women in mind. There is no need to wear it in, like some leather belts may require. Valeo provides some top value for money weightlifting products which we have also reviewed on other areas of powerliftingbelts.org. These low profile weightlifting belts are actually available in a 4-inch and a 6-inch version. Here we are looking at the 4-inch version suitable for ladies. 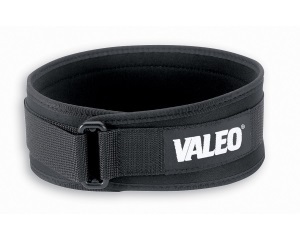 This Valeo weightlifting belt is very lightweight and inconspicuous, so people may not even realise you are even wearing about and you may forget that you’re wearing it yourself. It features a soft inner lining, and the foam core is waterproof so that it will not get drenched in sweat during an intense workout. Sizing is important as getting the wrong size could mean that the Velcro strap may not fit as securely as it could. It is important to measure yourself properly around your midsection on top of your clothes before selecting a size. Also, the plastic loop ring may put some off, but we had no sign of ours breaking during tests. The level of support that this strap provides is pretty good given its design and not being a leather weightlifting belt and given its price. This is a great belt for beginners looking to get a bit of extra support for the back. RitFit have been around for a couple of years and are based in New York. This is larger than most of the other weightlifting belts on our list as it is 6-inches rather than 4. This is a solidly designed belt which has a very slight taper around the sides. So with this, you will get more support but it was still a allow you the freedom to move. It features a foam core which is comfortable and also waterproof and the front torque ring is metal. 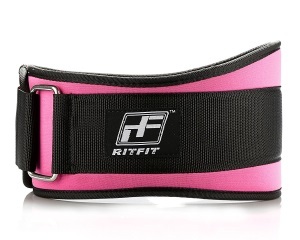 This RitFit womens belt feels very secure and snug once it is put on and adjustment is easy. We feel this is more of an intermediate weightlifting belt for those who sometimes do a little heavier work than CrossFit but still do exercises that require the flexibility too. If you have a shorter torso, this belt may be too wide for you and for it to be comfortable on your rib cage, if tightened too much. The sizing of this belt seems to be correct, so you don’t need to be so exact with your measurements when selecting your size. The RitFit can be worn for an extended weightlifting session in comfort, and it also comes with a lifetime guarantee which is great peace of mind. For those of you who aren’t in the CrossFit scene, WOD stands for Workout Of The Day. So that should give you an idea that this belt is designed mainly for CrossFit. It’s also suitable for women and features a comfortable foam layer and edges covered with a strong material so they don’t fray. It provided us with all of the support required to get through a CrossFit workout. It is lightweight and can be packed into a gym bag easily as it folds up tiny. But it is very lightweight and so would not really stand up to heavy lifting for squats or dead lift. 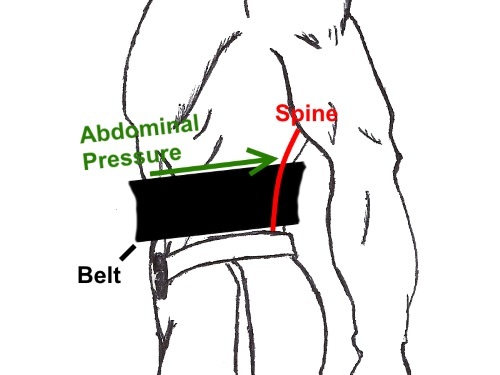 When trying to perform heavy exercises with the belt tightened, we found that it was a little uncomfortable on the stomach area showing that this is not really designed for heavy use. 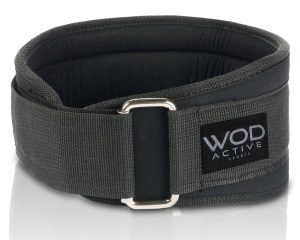 When the WOD belt is worn for CrossFit, it does the job and also looks the part. We especially liked the sturdy buckle on the front which also features a role clip something that we have not seen on other belts in this category. The big sturdy weightlifting belts that you may see professional powerlifters use have a lot of issues. They are heavy and can take time to wear in. They are also not particularly portable and can be awkward to put on, take off and adjust. Many of the weightlifting belts aimed at females are intended to overcome these issue and are designed for the more casual gym goer and are great for crossfit rather than professional powertlifters. What Do Top Women’s Weightlifting Belts Do? The purpose of a weight belt for women is the same as it is for men. Many people to not understand fully how a belt should be used and as such do not use them to their full potential. Their purpose is to support the spine and create pressure within the body. By increasing this pressure, the core is more stable and more importantly, the spine has more support. By using one correctly, your should be able to squat and deadlift more mass almost immediately. Put on your belt so that it feels tight when breathing out. Before performing your squat rep, take a deep breath. Push your stomach muscles out against your belt. This should also press your back firmly against it. Hold your breathe and attempt to exhale in a way you would if you were trying to move a piece of the furniture. While maintaining this, perform your squat rep. You should feel a lot more stable than you would without a belt. When you come back up, breathe and start the process again. You have probably heard gym instructors mention using correct breathing control for those heavy lifts. The primary purpose of controlling your breath during lifting is to stabilize your spine in order to improve both lifting efficiency (so you can lift more weight) and also for safety. Powerlifting involves moving as much weight as possible, and the spine transmits a lot of this force through the body. Therefore, it is a very good idea to keep the spine as rigid as possible. By keeping the core rigid through controlled breathing, the body is more efficient at weightlifting as it is sturdier and more robust. It’s difficult to hold your spine in a neutral position when lifting heavy weight. But without this, it can eventually cause the spine to fold under the load, potentially causing a slipped disc. Controlling your breath helps the spine to extend safely. Controlled breathing means that before performing a lift, you take a large breath which expands your abdomen. At the same time, you contract your abdominal muscles and try to push out against them. Now, you should continue holding your breath and holding this pressure on your abdominals. This should feel similar to if you were bracing your abs to be punched. Hold this throughout your heavy rep. When you finish or rep, it’s a good idea to try to maintain the pressure. You do this by not allowing your breath to escape completely. If you do allow the breath to escape fully, you will not be able to make your core 100% rigid again. So to maintain the stability and rigidness, you can use a technique called “topping off“. To “top off”, after completing your rep, you exhale shallowly and quickly and then inhale deep while contracting your abs again. Then perform your next rep. The process is the same for men and women. If your abdominals are feeling a little weak, a great way to strengthen them is with an ab toning belt. The output from all of the breathing techniques described above can be amplified by the utilization of a weightlifting belt. A weightlifting or powerlifting belt can do this by constraining the abdomen and giving it something to be applied against. By doing this, the intra-abdominal pressure within the body is increased and makes the body’s ability to lift weights more efficient. The belt also makes holding this pressure throughout the entire lift or set easier. Weightlifting belts are commonly used for strength sports such as strongman, Olympic weightlifting, and powerlifting, but they have recently become very popular among powerlifting athletes. There are a few common misconceptions regarding the use of weightlifting belts for powerlifting. One of these is that if you use one, it allows you to become lazy and not utilize your abdominals to brace and create the required level of intra-abdominal pressure. But using a belt correctly is actually the opposite. When a powerlifting belt or weight belt is used properly, it will provide feedback to its wearer when they are bracing their core. This will result in a stronger and more stable lift. This also helps prevent the rounding and flexion of the lumbar during an exercise such as squats or deadlift. Plus it helps in the prevention of spinal hyperextension when a heavy load is lifted overhead such as when performing a clean and jerk. What Are The Benefits Of Belts For Females? Safety – From increased sustainability, the collapsing of the spine is prevented. The amount of strain on the lower back is also reduced, and the belt will restrict the range of motion of the lumbar preventing any additional strain. Performance – The stability also assists with been up to lift more weights. By having a more stable core, the body can support more weight and thus lift more. I got the fire team fit one and it really helped me feel more supported and I cant get over just how comfortable it felt. I’m an amateur powerlifter and my cheap belt has got pretty worn out over time. Do they lose their ability to provide support as they get softer and worn out? belts get softer (and cracked if we are talking about leather), they can become loose and not provide the level of support around the entire belt as they probably did when new. I just got my dark iron leather belt and its a little tougher than expected. I wish i went with a more comfortable one. I’ll give it a try an hopefully it will get more comfortable over time. 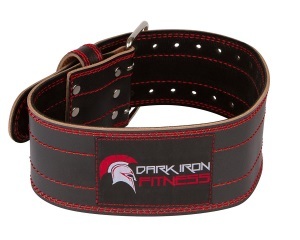 Can a using one of these belts help me when doing standing shoulder press with a bar? Hi Francesca. Yes, a belt would help to keep your back stable when lifting a heavy weight overhead. Are any of these belts good for both powerlifting and crossfit at the same time? Thanks Stacy. We will try and get one for a review. would a belt be recommended if I have had surgery on a bulging disc. I now have a fear of making it worse if I lift weights again.